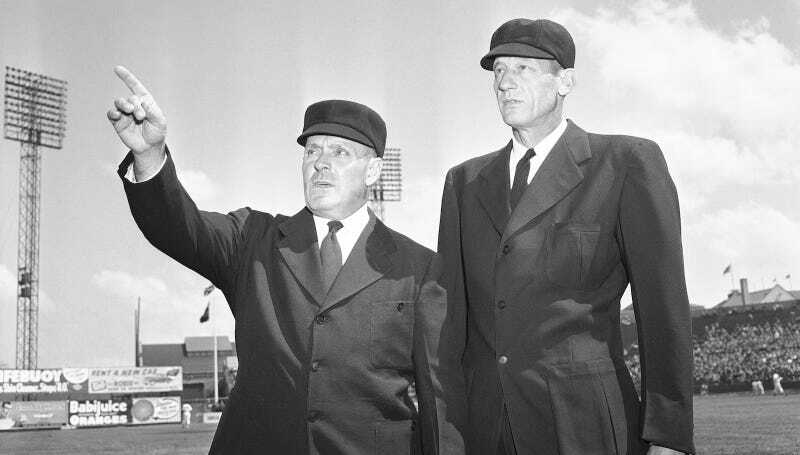 Umpires Lon Warneke and Bill Stewart in 1949. Image via AP. Last week, on the brisk October evening that marked Game 1 of the World Series, I sat at a Brooklyn sports bar inside a galleria and noticed that a man on the field was wearing a suit. After Jezebel Editor-in-Chief Emma Carmichael corrected me, explaining that the man in the suit was not a catcher but in fact an umpire (I like basketball), I became curious about his sartorial condition, both its formality and the practicalities of it: Why such an official kit plopped among the overwhelmingly uniformed? What’s going on with the Game of Thrones-style breastplate? And most importantly, doesn’t the ump worry about sweating in the suit? New York Giants manager John J. McGraw and National League umpire Bill Klem, in a very natty three piece suit, in 1922. Image via AP. As it turns out, umpires have been wearing formal attire for the nearly two-century history of baseball in the U.S. Back then, as now, the ensembles were specifically worn to differentiate the umpires from the players, and to imbue them with higher authority. John Thorn, middle, wearing an 1860s umpire uniform while overseeing a vintage re-creation game (played by 1858 rules) in Tarrytown, NY, 1990. Image courtesy John Thorn. A 1913 advertisement; An illustration, date unk. ; Umpire Charles Daniels, April 1888. Images courtesy John Thorn. As baseball became more popular in the 1870s (the National League formed in 1876), umpires’ suits were in keeping with the styles of their day, and the distinctly formal look gave them a dignified edge. But contrary to some reports, umpires in those early days weren’t just lawyers or doctors working a side gig, says Thorn. “Even then the players were likely to dispute calls, and an umpire who had a pugilistic background might be better equipped to handle a rowdy player than a banker or a doctor or a dentist.” In other words, an umpire had to know how to throw hands—so much that one of the most famous umpires, Billy McLean, was also a boxer by trade. Umpire Gersel, wearing a suit and cap, watches the Chicago White Sox’s Metzler slide on the Yankees in 1932. Image via Getty. Though player and fan abuse of umpires dissipated around World War II—“‘Kill the umpire’ was not an idle threat,” says Thorn—the tradition of suit-wearing umpires has lived on and even evolved. When the National League began employing individual umpires, it developed regulations for them to maintain the visual effect of having an elevated authority. But there were also more practical reasons: umpires wearing any individual team’s jersey could send a signal to the fans that they were making unfair calls. “Like Trump kinda claimed the election is being rigged,” explains Thorn, “home-team fans typically claimed that the umpire was in the fix.” The fix, as it were, was a notion or paranoia that umps were on the payrolls of bookies; in 1882, one umpire was banned for life for being in cahoots with gamblers. Umpire being attacked by unhappy players (but dressed well!) in a 1988 illustration. Image courtesy John Thorn.